The geopolitical situation in the Mediterranean before the First World War has been generally ignored by historians. However, in the years before the War, the fact that the Mediterranean was shifting from British control to a wide open, anarchic state occupied the minds of many leaders in Austria-Hungary, Italy, France and Great Britain. This change was driven by three largely understudied events: the weakening of the British Mediterranean Fleet to provide more ships for the North Sea, Austria-Hungary's decision to build a navy capable of operating in the Mediterranean, and Italy's decision to seek naval security in the Triple Alliance after the Italo-Turkish War. These three factors radically altered the Mediterranean situation in the years leading up to the First World War, forcing Britain and France to seek accommodation with each other and France to begin rapidly building ships to defend both British and French interests. However, all of this activity has been largely obscured by the July Crisis of 1914 and the ensuing World War. Traditional history has looked backward from these events, and, in so doing, ignored the turbulent seas building in the Mediterranean. Conversely, this dissertation seeks to understand these events as they unfolded, to understand how policymakers understood the changing Mediterranean world. 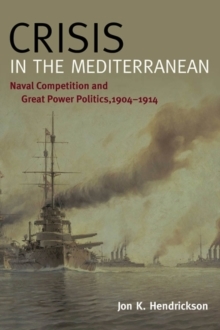 Ultimately, this dissertation seeks to redress the imbalance between historians, who have viewed the history of the Mediterranean in the early 20th century as a largely stable one, and policymakers in the Great Powers, who viewed the Mediterranean as a highly unstable region, and struggled to come to terms with that instability.